I am so excited for my blog day to be the first day in Library Week! I love libraries. When I was growing up, I spent so much time in the libraries. I used to hang out in the cook book aisles. I loved my fiction as well. I guess it's no surprise that I started with early cook books like: Pretend Soup and other real recipes by Molly Katzen and Roald Dahl's Revolting Recipes. I was into the Cam Janson mysteries, too. The library was like a magic shop where you could find anything you wanted. If they didn't have it the librarian could get it. She was like a magic fairy godmother. A wave of her wand and I could take home any book I wanted. I tried so many recipes on my poor parents. But after a while, I learned that I loved to make yummy nutritious meals. It set me on the course of becoming a personal chef. Now that I live in London and work in the palace, I also get a view of some gorgeous private libraries. 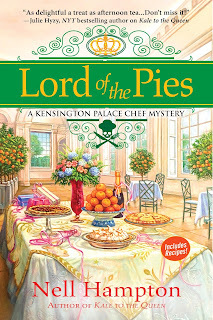 The best part is Lord of the Pies, which releases this Tuesday, April 10, 2018 and Kale to the Queen are found in libraries for others to enjoy. As I look at the wonderful private libraries of London, I imagine that if I had space I would fill my own library with cook books. If you could build your dream library, what kind of books would you fill it with? 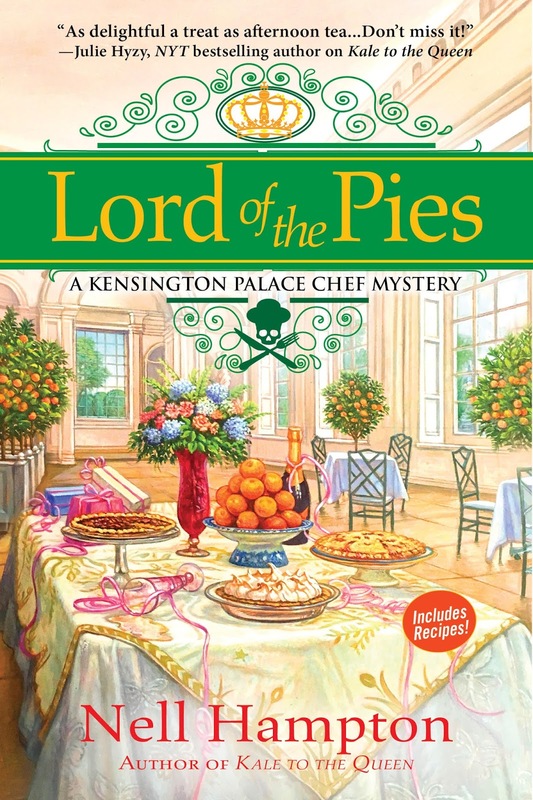 Comment for a chance to win a copy of Lord of the Pies. If I could build my dream library, I would want a variety of books so I'd never be bored and always have a place to escape to, relax and read to my hearts content. I do have four main areas of books that I love the most so they would probably dominate most of the space. That would be cozy mysteries, Amish stories, clean fun romances and last but not least cookbooks since I love to bake and cook to bring smiles to the faces of those I love. Thank you for the wonderful chance to win a copy of "Lord of the Pies"! Since pies seem to be one of my specialties (well at least if given the option that's what everyone asks for), this book is right up my alley. I’d have a lot of mysteries, fantasy, vampire books, cook books and books about nature because that’s what I tend to read. But I’d include anything else that caught my interest. My personal library already has over two THOUSAND books in it and it's still growing. I've been collecting books for almost 60 years. My dream library would be part of a big house in the country, at least 30'x50' in size. It would be totally wired for internet and cable tv. Tall shelves with a rolling ladder to reach the high parts. I collect Brit mysteries, cozies, science fiction, fantasy, contemporary romance, paranormal/romance and of course my collection of cookbooks (many from restaurants that no longer exist). My dream library would be full of cozy nooks where you could hide away with your newly selected books. It would also have a book maze for mystery book lovers. The children's area would be full of bean bag chairs and cozy "poufs" and have an incredibly soft carpet and be a place where the kiddos could just plop down anywhere and read (and want to read). Cozy books would have their own cozy room with a fireplace, of course. Then there would be a room like a library in a great manor house for history books, biographies and non-fiction. Cookbooks would be in a wonderful, bright, high-ceilinged, airy room with lots of tables so you could spread out with all your books while planning that perfect meal and it would smell like fresh-baked bread! I think we have Ben Franklin to thank for free public libraries. It would contain all the books by favorite authors and series. I love libraries. I also spent a lot of time at the library when growing up, it was right next door to my school. I would like to have a library and I would fill the shelves with the many books in my collection. It would mostly be mysteries, chick lit, history. I love the look of all those old leather bound books, so part of my library would be filled with those books & the other part would be filled with all those books I can pull down & read. If I could only choose one type of book, I would fill it with books about animals of all kinds. But, I would hope I could add others like cozies, thrillers, medical and legal thrillers, romantic suspense and comedy and, of course, cookbooks. I would like a variety. Enjoy the historial romances, a little mystery and would love to have a few on hand to share with children that might stop over. I'm an eclectic reader, so the sky's the limit. My dream library would have mysteries, of course, as well as cookbooks and women's fiction and romance. Lori B - you are the winner! Look for an email soon asking for your address to ship the book. I would fill my dream library with all the cozy mysteries that have been published, all mysteries besides cozy, cookbooks, books about Wicca, books about gardening, herbal medicine, and DIY books.